A pony is a small type of horse that stands less than 14.2 hands high. This doesn't mean that a midget horse is automatically a pony. Ponies are members of distinctive breeds, and you get a pony by breeding two ponies. There are numerous breeds from all around the world. In the show ring, ponies are divided into three height classes: up to 12.2 hands high, up to 13.2 hands high, and up to 14.2 hands. This is the one that most people seem to think of when they here the word pony. These are really short ponies, usually about 11 hands tall - great for small children. They come in many colors. These originated by crossing the Appaloosa and the Shetland pony, and usually have Appaloosa markings. These are good ponies for kids. They are commonly referred to as a POA. This is a refined looking-pony, one of the taller ones and so is suitable for many adults. 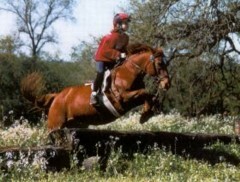 The Connemara makes an excellent jumping pony. 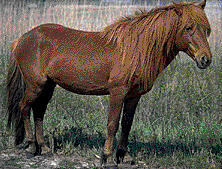 The Chincoteague is a feral pony living on two islands off the Virginia coast. First discovered there in the late 1700's, the herds are managed by the Chincoteague fire department, who rounds them up the ones on Assateague Island on the fourth of July, and swims them across the little stretch of ocean to Chincoteague Island for auction. This is a rather stubborn pony, but they are broken for riding. They come in all colors, with pinto being the most common. Read the next horse breeds article on Hanoverian Horse.